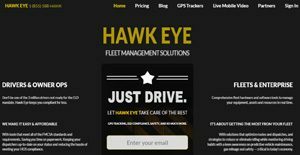 Hawk Eye is a fleet management solution that assists drivers, dispatchers, and businesses in conducting ELD-compliant operations. The web-based software comes with industry-standard tools that enable fleet operators to track vehicles, monitor drivers’ habits and ensure their on-the-road safety, gauge gas mileage, and more. With Hawk Eye, paperwork is completely effaced. The solution provides the necessary functionalities on its dashboard to facilitate paperless management and transactions, saving companies and organizations paper costs. Moreover, Hawk Eye allows owners and managers to optimize their fleet. Smart tools allow for preventive maintenance, trend analysis, and comprehensive inspection reporting. Further, since the application is web-based, transition is not difficult and new users can start improving their operations immediately after signing up for the fleet management solution. Hawk Eye provides all the tools necessary for efficient management of a fleet. With this application, businesses and other organizations are able to manage their resources and all aspects of their operations from a single interface. As the tools they need are reachable only in a few clicks, they are able to better perform tasks and increase application productivity. Hawk Eye is completely in the cloud, so business owners and fleet managers can monitor vehicles on their mobile devices from anywhere at any time. This enables them to be productive and responsive to drivers and issues even outside of the workplace. With Hawk Eye, offices can say goodbye to any kind of paperwork. Work processes are more streamlined and organized from one interface as all information are stored directly into the cloud and accessible whenever needed. In addition, drivers are equipped with mobile solutions that afford them electronic transactions with customers. They no longer need to hand out documents for signatures, only a device for electronic acknowledgement of receipts. Hawk Eye Fleet Management Solutions facilitates compliance with industry standards. This reduces the hassle of conforming to requirements with reporting templates that allow employees to get documentation done swiftly. With this, they can focus their attention to operational tasks rather than on administrative chores. Hawk Eye flawlessly integrates with GPS devices attached to vehicles to enable dispatchers to track vehicles in real-time. This feature ensures that drivers are adhering to the planned route and are not violating road rules and amassing infractions. Additionally, real-time GPS monitoring allows for flexibility. In case of road closures for example, the dispatcher can instruct the driver to take a different route to ensure on-time delivery of goods. Hawk Eye has a host of features that allow the office and the driver to communicate seamlessly. Two parties can exchange live messages and instantly share files. On top of that, live video chatting is also supported by the solution for smooth communications. If you are considering Hawk Eye it might also be beneficial to examine other subcategories of Best Fleet Management Software collected in our base of B2B software reviews. Every business is different, and may need a particular type of Fleet Management Software solution that will be fit for their business size, type of clients and staff and even individual niche they deal with. We advise you don't count on getting a perfect software that will work for every company regardless of their background is. It may be a good idea to read a few Hawk Eye reviews first and even then you should keep in mind what the software is supposed to do for your company and your employees. Do you need a simple and intuitive solution with only elementary features? Will you really use the advanced functionalities needed by pros and big enterprises? Are there any particular tools that are especially useful for the industry you operate in? If you ask yourself these questions it is going to be much easier to find a reliable service that will fit your budget. How Much Does Hawk Eye Cost? We realize that when you make a decision to buy Fleet Management Software it’s important not only to see how experts evaluate it in their reviews, but also to find out if the real people and companies that buy it are actually satisfied with the product. That’s why we’ve created our behavior-based Customer Satisfaction Algorithm™ that gathers customer reviews, comments and Hawk Eye reviews across a wide range of social media sites. The data is then presented in an easy to digest form showing how many people had positive and negative experience with Hawk Eye. With that information at hand you should be equipped to make an informed buying decision that you won’t regret. What are Hawk Eye pricing details? What integrations are available for Hawk Eye? If you need more information about Hawk Eye or you simply have a question let us know what you need and we’ll forward your request directly to the vendor.